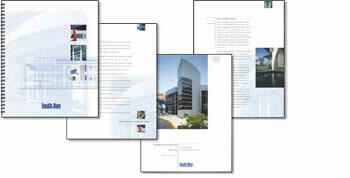 Use of wir-o binding allows client to update select pages without having to reprint entire brochure. 32 pages with tabs. Inside back cover pocket. 4 color process plus emboss, wire-o bound.